Hiring a traditional thatched Kerala houseboat and exploring the backwaters is a quintessential Kerala experience. However, there are a few important things you should know in order to go about it the right way and make the best decision. The majority of houseboats are hired from Alleppey, the gateway to the backwaters in between Kochi and Kollam. Most houseboat operators and around 500 houseboats are based there. Many resorts and luxury hotels have their own houseboats as well. They offer sunset cruises and overnight trips. Other hotels will be able to readily arrange a houseboat for you. That way, you can combine staying in a hotel along the backwaters with a houseboat ride. Take a look at 10 Relaxing Kumarakom Hotels and Resorts and 8 Best Homestays in Alleppey on the Kerala Backwaters for inspiration. How Long Are Houseboats Hired for? You can hire a houseboat for as little as a day, or as long as a week! It's really up to you. Day trips run from around midday until 6 p.m. Most people go for overnight hire, which includes a serene sleep out in the middle of nowhere, in a lake or other similarly peaceful spot. The houseboats then return by 9 a.m. or 10 a.m. the next day. Two-night houseboat hire is also popular. However, it can become boring for any length of time longer than this. 48 hours on a houseboat is definitely long enough to take in all the sights and re-charge your batteries. What's the Best Route to Take? Alleppey-Kuttanad -- renowned for its paddy fields, it has an extensive network of narrow backwaters and is an excellent destination for experiencing village life. Intriguingly, farming is done below sea leave in this area. Alleppey-Kumarakom -- many luxury resorts are located on the banks of Vembanad Lake in this area. It's also renowned for the Kumarakom Bird Sanctuary. The canals are much wider, and you'll cross the large expanse of the lake. Alleppey-Alumkadavu -- located near Kollam, this is a particularly long cruise and is either a one-way day trip or overnight return. The houseboats are traditionally made there. How Much Does It Cost to Hire a Houseboat? The cost of houseboat hire greatly depends on the quality of the boat and the time of year prices triple from late December to early January). The minimum rate for overnight hire is around 5,000 rupees ($90) without air-conditioning. Most people pay around 10,000 rupees ($150) upwards to hire a deluxe air-conditioned houseboat for two. Rates easily go up to 18,000 rupees ($250) or more for a luxury houseboat. Large family sized houseboats, with multiple bedrooms and living rooms, are also available for hire. Prices start from around 20,000 rupees ($285) for one of these, for an overnight trip. The cost should include freshly cooked food, made by an onboard cook, and drinks. Do check to make sure you'll have the houseboat to yourselves if this is a concern because many houseboats have more than one bedroom. One other thing to keep in mind is that some houseboats have an upper deck lounge area, where you can relax and enjoy the view. This is desirable as it gives you privacy away from the staff. When Is the Best Time to Hire a Houseboat? Peak season is from December to the end of January when the weather is cooler and dry, but it's possible to hire a houseboat all year round. Some people find that the monsoon season has special appeal and choose to combine their houseboat hire with an Ayurvedic treatment. Attractive monsoon discounts are offered as well. March to May gets very hot and humid, so if you hire a houseboat during this time, an air-conditioned one is definitely recommended. What Are Some Reputable Kerala Houseboat Operators? There are so many houseboats for hire at Alleppey that it's not necessary to book in advance, apart from during the peak season. Instead head down to the jetty in the early morning (before 9 a.m.), inspect the boats there, and negotiate the best price. Then go back to your hotel, pack your belongings, and when you return to the boat it will be ready to depart. During peak season, the availability of quality boats drops dramatically, and prices get hiked. As prices aren't properly regulated, they can fluctuate widely. To get an idea of prices and what's on offer (and also to book in advance if you wish), reputable companies that have a range of houseboats for hire include the opulent Spice Coast Cruises, Kerala Houseboats, Lakes and Lagoons, Morning Mist Cruises, River and Country Cruises, and Ayana's Houseboats. If you're visiting Kochi and want to include a backwaters trip as part of your experience, it is possible to go on a convenient day tour from Kochi. 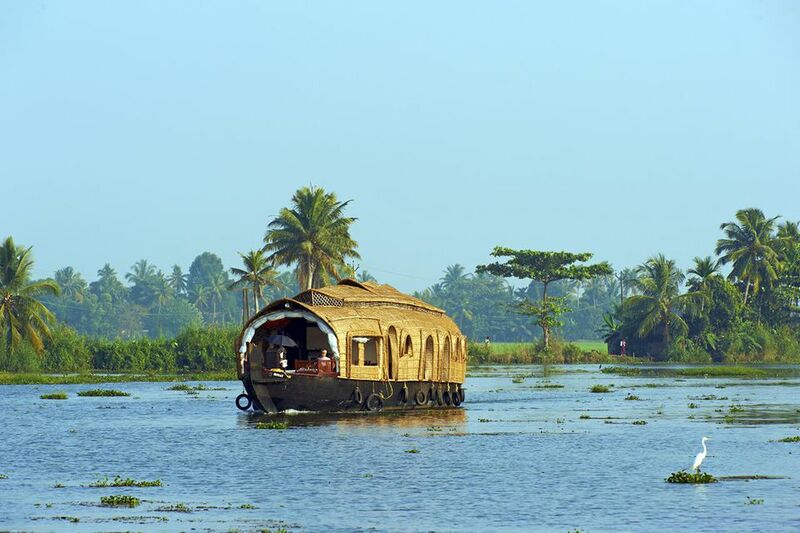 Take a look at this Private Kerala Houseboat Day Trip. It's easily bookable online. Kochi-based Salmon Tours also specializes in village backwater day tours in country boats, houseboats, and speedboats.